Note: This post originally appeared in Medium. It has been republished here with permission. 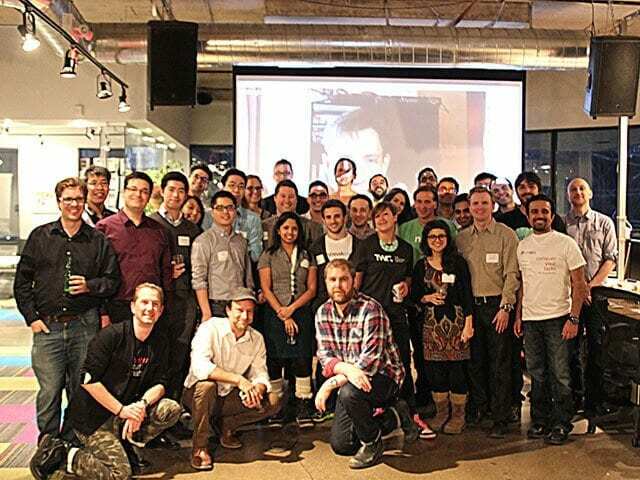 How do you help promising startup teams in your community get ready to pitch the world’s top accelerator programs, like Y Combinator and Techstars? This spring we organized Toronto’s first ever NEXT program — an intensive course for entrepreneurs that aims to do just that. It was the first time NEXT has happened in our city, and our first time as program organizers, so I wanted to write a little about what we learned from the experience. 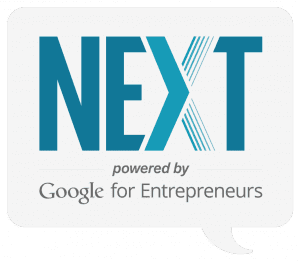 NEXT is powered by Google for Entrepreneurs and managed globally by Up Global, the non-profit which helps empower entrepreneurs and their communities around the world. Teams taking part in NEXT spend five weeks working through Steve Blank’s Lean Launchpad curriculum with the aim of establishing product-market fit and getting (wait for it) accelerator-ready. Validation: Ideas aren’t startups. Get from the idea to startup phase and on the path to building a scalable startup. Mentorship: Learning is everything. Get weekly feedback from mentors, coaches and startup experts. Exposure: The best NEXT teams get invited to the NEXT First Look Forum — a demo day style event with accelerators, investors, and media. So… how did we do? The NEXT global team provides local organizers with a bunch of useful resources, including an outline curriculum and mentor expectations. Each week, the teams and their mentors got together at The Working Group to talk through their progress. The teams we selected were all at very different stages with their customer validation. Some were just beginning the process, whilst others were already in market with paying customers. It quickly became apparent that applying a rigid curriculum wasn’t going to be the best way to help everyone progress. Instead, it’s about choosing mentors and program leaders with a deep knowledge of customer dev tools and having the flexibility to shape what’s being taught to suit your cohort’s specific needs. Next time around we’d look to pick a smaller number of teams (we had thirteen startups in total where eight or so would have been better) at a more equal level. NEXT are also exploring making some level of customer development work a prerequisite of applying for the program. Having knowledgable, high-profile guests speak to the teams helped them to stay inspired when things got tough (around the 3rd or 4th pivot for some…) We were super lucky to hear from Bob Dorf, Brant Cooper and Kevin DeWalt. Thanks to sponsorship from the CDMN we were able to have Kevin on board as a mentor for the duration of the program, and I’d definitely recommend putting some of your sponsorship dollars towards securing a high-profile mentor. It’s great for the teams, and as another angle to help you promote the program when you’re inviting startups to apply. More explanation of key concepts, or more care in checking the startups level of understanding, might have been helpful. One of the biggest challenges of the program was finding the balance between pushing teams to be self-motivated/explore new ideas and delivering high-value educational content. Top takeaways: Stay flexible about what you’re teaching depending on the needs of your participants. Keep your cohort small, and curate team selection carefully so that teams are at a similar level. One of my biggest fears was that it would be difficult to keep our mentors engaged and active throughout. The time commitment for a course like this isn’t insubstantial, and the mentors we invited are all highly experienced, engaged entrepreneurs (read: people who are usually crazy busy). Thankfully, my fears turned out to be unfounded. Whilst there was a small amount of drop-off from the mentors, we had a highly-engaged core posse who came out week after week and were happy to spend time with the teams outside of the evening sessions. Yay! Hand-picking people from our networks that we knew would add real value. Really thorough communication of mentor expectations before kick-off, plus weekly reminders and calendar invites for each session. We tried to be as clear as we could that this was a commitment for the mentors as much as for the startups. Regular post-session mentor drinks facilitated some great networking/relationship building. The thing about having great mentors is that they’re an opinionated bunch. And those opinions aren’t always the same. One key thing to communicate to teams taking part in a pre-accelerator program is that they’re going to get hit with LOTS of good information — so much that it can feel quite overwhelming. Make sure they know that it’s up to them to boil it down and take some time to figure out what’s best for them. We found that the mentors tend to gravitate towards teams which show the most potential. As program organizers, its up to you to make sure that all the teams are getting the attention they need by making those introductions and pushing them to reach out to the mentors. It’s also important to make sure the sessions allow all of your mentors to share their expertise in a way that suits their teaching style. 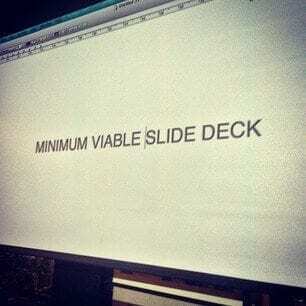 We spent more time “pitch style” with our teams, where they presented their learnings to the whole group and the mentors and received feedback publicly. More of a balance between group feedback and small group / one-on-one sessions would have been valuable. NEXT’s goal is to be to accelerators what accelerators are to VCs. That means the top teams from NEXT will be off to NYC to pitch the world’s best. Which is awesome. But what else can be done at a local level to help raise the profile of your pre-accelerator and get the word out about the teams taking part? Pick a program hashtag ahead of time (ours was #NEXTTO) and make sure you share repeatedly with your cohort, mentors, sponsors and judges. Written and verbal reminders help to drive online conversation which in turn helps to raise the profile of your program. We also sent pre-written sample tweets to our mentors announcing that they would be taking part in the program — with the goal of making it as easy as possible for them to spread the word. We also used Storify (one of my favourite social curation tools) throughout the program to track the adventures of our cohort. Clue in your local tech media about the program and see if you can convince them to cover your key moments. We sent out a press release to announce the program, an update about the teams taking part and an announcement about the winners. It will make you life easier if you prepare the final release in advance of the winner announcement, so all you have to do it plug in the final details about the winning teams. 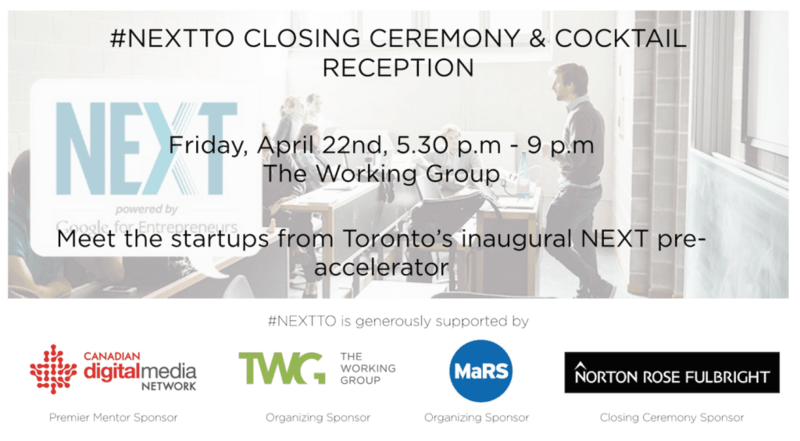 You can view all of the #NEXTTO press releases here. We turned the end of the program into an event by inviting media and investors to a cocktail reception and to watch the startups pitch to our panel of judges. The teams got a chance to celebrate their successes and the successful completion of the program, and the rest of the community got an opportunity to learn more about the value of a pre-accelerator program. If the startups from our inaugural cohort got half the value as participants as I did helping to organize then I’m going to chalk this up as a success. Wrapping up #NEXTTO I’m feeling more inspired, focused and driven than ever before, and I have a feeling that some of the connections made during this past five weeks will turn out to be exciting and productive in ways we haven’t even imagined yet.